Blooms Landcare in Trophy Club, Texas believes in making your yard a beautiful outdoor haven. 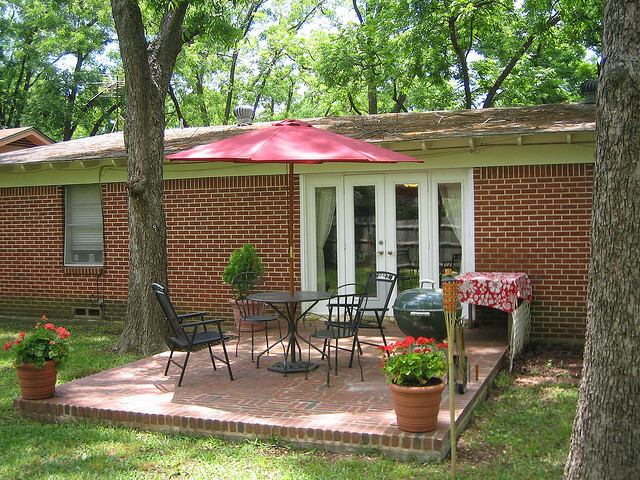 Patios can be a great asset to a home. Installing a patio can not only take the place of muddy, hard to landscape, yard areas, but can also be a great place to relax. 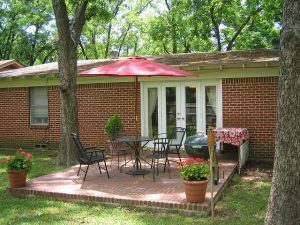 Couples, families, and individuals can use their patio for gatherings as well as peaceful sanctuaries to enjoy the outdoors. Blooms Landcare’s staff of professional landscapers can help you determine the best layout for a pretty and peaceful patio and yard. We don’t just stop at installing your patio; we also offer counseling on what features would accent your patio or outdoor space. This includes the planting of shade trees and specific plant life. Another option to consider is that not all patios must be alike. Blooms Landcare in Trophy Club would be happy to turn your patio into the masterpiece you desire. Stone work can make your patio look castlelike, and can even turn a portion of it into a gazebolike space. Blooms Landcare also offers furniture and decorative pots to give your space that extra touch of style. As you can see the options are endless. Guests will be amazed at the wonderful view your yard has to offer. Patios can be a great asset to a restaurant as well. Installing a patio can not only make way for more seating which means more guests, but also offer a more romantic option. Couples and families alike can come into the establishment and enjoy their dinner below the clouds or stars. The experience will keep them coming.